My dialect map based on NY Times quiz. Dec 2013. I’m from Connecticut! My mother, who had a Ph.D. in English linguistics, used to say that she listened to a linguist on the radio pre-World War II. The host of the show would have callers recite a list of words and guess their U.S. geographic origin based on dialect. Apparently, the man was quite accurate and the show made for fun listening. After World War II, when people moved around more, dialects were less apparent. Now, however, I’ve heard modern day linguists say that while slang permeates society fairly quickly due to television, dialects are as strong as ever. It’s funny how language changes. The New York Times recently published a test titled How Y’all, Youse and You Guys Talk, which allows the user to create a personal dialect heat map in a few minutes by answering 25 questions about word meaning and pronunciation. The test is based on a Harvard Dialect Survey that began in 2002. In my case, I grew up in Connecticut, spent my college years in Texas, and then worked in Maryland, New Hampshire, Massachusetts, and California as an adult. 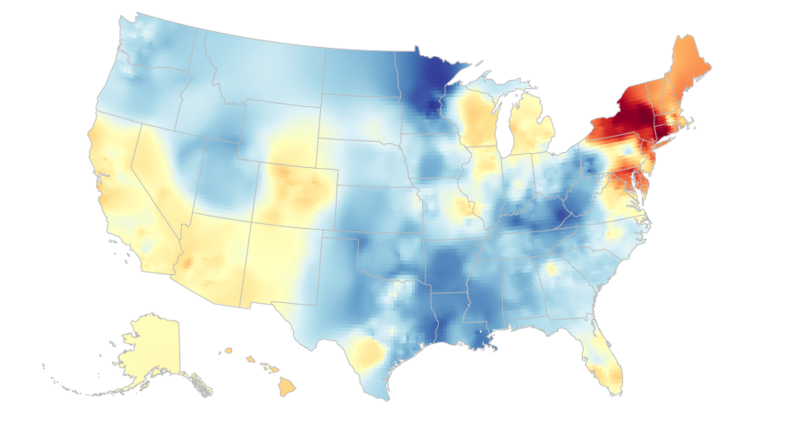 It appears that my dialect map correctly identified my Yankee roots. Very neat! Fun quiz! I took the quiz–and it indicated that I spoke most similarly to people from two distinct areas. I’ve lived in both of the areas–but currently live in a third locale.